Let's team up to tackle high drug costs. Competition is what makes markets work. It's what keeps prices down. So when brand pharmaceutical companies tilt the playing field, drugs become less affordable and less accessible. The bipartisan CREATES Act (S. 340/ H.R. 965) would level the field, saving patients billions. Join the fight and let your voice be heard. Share the video and infographic below to help educate lawmakers about REMS abuse. Read more about this infographic on our blog. Share this page or social image to raise awareness about this issue. 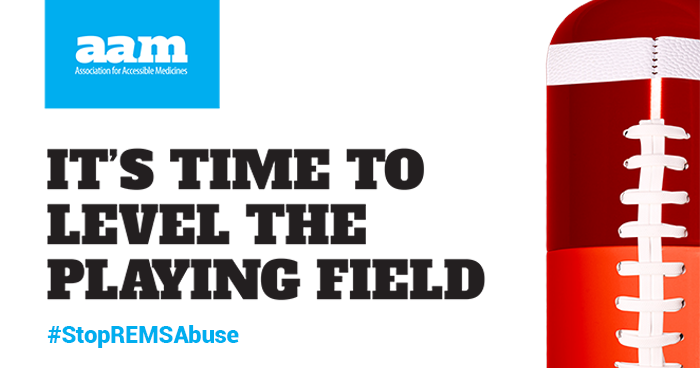 Learn more about the Stop REMS Abuse campaign.